Pms (pharmacy management system) is a software application to manage the day-to-day business activities of pharmacy retailers. Medeil pms enables pharmacy s to transform from a predominantly ledger-based documentation to a system-enabled solution that is better aligned with their goals of improving quality of care with increased efficiency and accuracy. Medeil pms has been built as a stand-alone application. Medeil is built upon a database and application architecture that is both strong and robust resulting in a highly scalable product that can handle heavy usage. Medeil is, built using java, a platform independent application that can run on any operating system. MEDEIL Free Edition Pharmacy Software is a business program that works under windows xp, windows vista and windows 7. Estimated download time for MEDEIL Free Edition Pharmacy Software on a common adsl connection is Eight minutes. 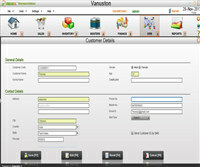 Version 1.0 was released one thousand three hundred thirty six days ago by Vanuston Intelligence Private Limited. Click the green download button to download it now.